One of the most stimulating (and simultaneously frustrating) things about getting a yacht ready for an extended cruise is the steep learning curve. Plumbing Systems: high-throughput bilge pumps, pressurized water heaters, propane locker venting systems, and "plumbers' wax" etc. Diesel Systems: fuel filtering, raw water circulation systems, fuel line bleeding, etc. We even changed the oil yesterday without making too much of a mess. Sails: including differences in cut, sail cloth, sail shape, partial vs. full batten, reefing systems, etc. "Making Things" which is a catch all category for everything we need but can't buy off the shelf. For example, last week I made a cool 30' long super strong dinghy security cable at Svendsens (with the help of their friendly staff, of course). And I'm currently helping Bill install an 8' radar tower that will also have a sweet hoisting system to get the outboard on and off the boat. 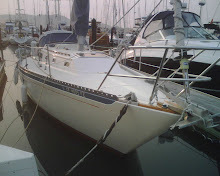 The point is, getting ready to go on a cruise is a little like becoming a mechanic, plumber, electrician, and carpenter all rolled up in one...in addition to the (obvious) pre-requisites of knowing how to sail, navigate, and anchor. While I've always thought sailing is good for the soul, I've come to the conclusion that cruising is good for the working the cobwebs out of the brain, too. Especially at this point in my life, when I'm done with college, grad school, CFA, etc., it feels good to flex the grey muscle a bit.